What’s the Best Memory Foam Pillow? Sweet Dreams Ahead! Getting a good night’s sleep isn’t always just about the mattress. Sometimes, it’s the pillow! Memory foam mattresses have become very popular in the last few years, but memory foam pillows are the unsung sidekick. Before even investing in a new mattress, it might be worth trying out a memory foam pillow first. It can be hard to determine which is the solution (mattress vs. pillow), but the pillows are more affordable, so it makes sense to start there. What Makes A Good Memory Foam Pillow? 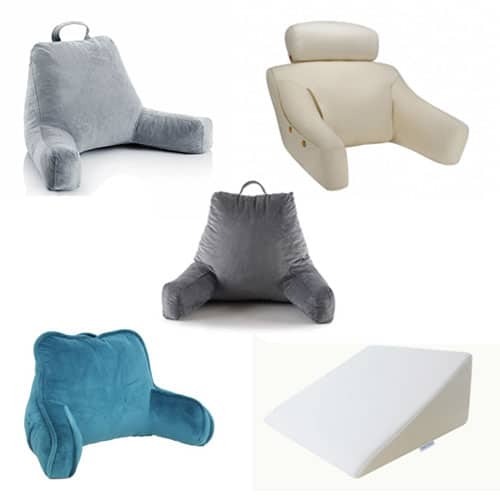 Provides Support/Pain Relief: This is the main reason people go with the memory foam pillows. They tend to provide better neck support and pain relief than standard pillows. When I’m evaluating a good memory foam pillow, this is the very first component that I look at. Without this key ingredient, not much else matters. 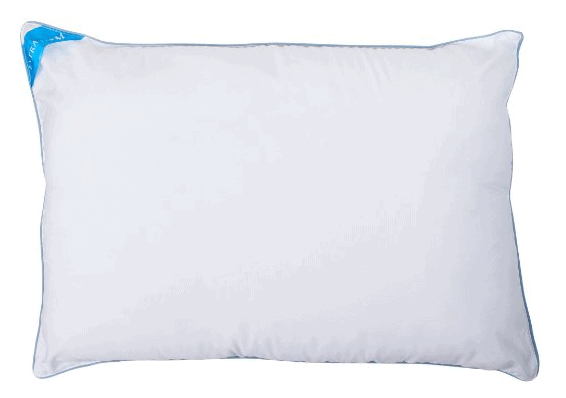 Durability: In short, a good memory foam pillow will maintain it’s firmness and shape over time. You should NOT have to fluff or re-fluff the below. Secondly, the pillow should be made of quality materials that will last. Conventional pillows are relatively easy to replace, but memory foam pillows are a more significant investment and *should* be built to last. Proper Aeration/Ventilation: Memory foam pillows are more expensive than ordinary pillows so you should expect a few extra features. One of the common, but not always properly implemented, features is ventilation and a “cooling” effect. The best memory foam pillows have it. Some do it better than others. Positive Reviews: I don’t necessarily buy into every negative or positive review, but I take the overall consensus into consideration. Especially if my experience lines up with what I’m reading, I’ll take the opinions of others into consideration when “weighting” the quality of a pillow. Value: Memory foam pillows cost a bit more, I’m alright with that. You have to pay for premium quality. I still look at the overall value. How does the price relate to the key features and “weights” mentioned above. I’m not above paying more if its worth the added expense. Warranty: One of the things I really liked about the Conforma is that it comes with a 3-year warranty against defects. This is a pretty serious warranty for something you’ll probably use every night. Aerated Core: A good memory foam pillow/mattress will be able to “breathe”, adapting to temperature changes. The Conforma comes with precisely such a configuration. This allows the pillow to avoid mold/mildew formation while also ventilating/cooling the air flow around your neck/head. This is a very solid feature to have. Good for Back AND Side Sleepers: This is actually harder to find than you might think. Many memory foam pillows are better (by default) for back sleepers. While most people are back sleepers, there is still a significant percent of side sleepers (and “mixed” sleepers) out there. Since I am one of these “mixed” sleepers, I found it to be equally comfortable both ways. Washable Velour Cover: Sometimes you get a great pillow with a shoddy case. 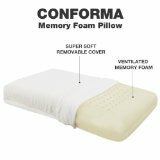 However, the Conforma comes with a cover specifically designed for the memory foam construction. It works with the foam to contour symbiotically with the foam and the fabric material helps maintain airflow and ventilation. 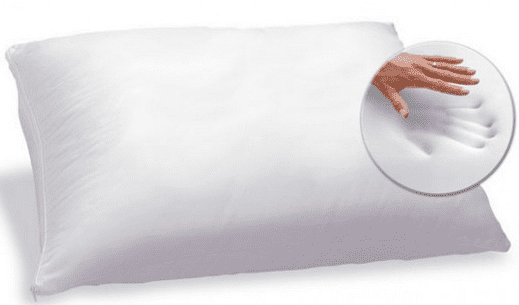 Affordable Price: You can easily spend upwards of $70 on a memory foam pillow. While the Conforma retails for around $70, it’s been selling consistently for less than $35 at this listing. Mite and Allergen Proof: This is a subtle little attribute, but something that I really like. The pillow is constructed in such a way as to retain it’s quality over time, without suffering the usual degradation of normal pillows. Works for Side and Back: Like the Conforma, the Contour is designed with both back and side sleepers in mind. Many memory foam pillows are not, so this is a nice note. Medium-Firm Support: It’s not for everyone, but I really like the medium-firm balance for memory foam pillows. It provides the right amount of support, while still allowing some pliability to find the right comfort level. Does NOT Retain Heat: Nothing is worse than a hot pillow on a hot night. The Contour comes standard with “SureTemp” foam that allows for “breathing” and prevents heat from building up overnight. Supports Spinal Alignment: It’s called the “Contour” for a reason. The specific shape is optimized to provide the proper spinal alignment to correct and maintain posture during the night. It’s naturally comfortable and naturally corrective, helping to reduce neck and back pain while you sleep. Very Cost Effective: I was really surprised to only have to spend about $25 on this pillow! This is where you can make the argument that the Contour is a better value than the Conforma. They are very comparable in price and quality. You can find the Contour for less than $25 at this product listing. Specific Design for Side Sleepers: The “gusseted” design is ideal for side sleepers. While the first two pillows I tested (above) “worked” for side sleepers too, this design was crafted specifically with side sleepers in mind. If you are a side sleeper – or predominant side sleeper – and have struggled to find a good memory foam pillow, I’d highly recommend the Iso-Cool Guesseted Side Sleeper. Really Does Keep you Cool: I have also questioned the notion that a pillow can “keep you cool”, but after using the Iso-Cool for a few weeks, I can honestly say that I noticed a positive difference. For some people, it’s probably no big deal, but once I started experimenting with aerated “cooling” pillows I didn’t want go back. The cooling technology works via microscopic beads that absorb extra heat or release heat to warm as needed. It’s nice that it works both ways (heating and cooling) as needed. Maintains its Support Over Time: Some of the popular mainstream brands start off nice and firm, molding to the form of your head, but then eventually become soft and flaccid, particularly in warmer climates. The Iso-Cool maintains the right balance of support and softness over time, without the need to constantly replace the pillow after a year or two. 15 Year Warranty: There’s a pretty hefty incentive to trust Sleep Better. A 15 year warranty basically means that if it even stops working as advertised, you’ll get a replacement or your money back. I’ve never “returned” a pillow, but this is nice to know. Pricing: The standard and contour versions are comparable in price to the previous two pillows reviewed. The Gusseted version will be a bit more pricey, coming in at around $53 (see this listing), but it’s still not a bad price when compared to what some of the mainstream brands charge. Unique Bamboo Cover: At first I didn’t know what to think. Bamboo? After using for a few days I quickly realized it’s a pretty unique construction. The cover is micro-vented for optimal airflow. The bamboo material works to keep things cool and is extremely comfortable. I’d imagine this is a good option for folks with certain fabric sensitivities. Shredding Foam Interior: Like some other memory foam pillows, the Snuggle-Pedic makes use of shredded foam to offer even support without pressurizing points on your head or neck. I had one of the best night’s sleep ever on this pillow, just FYI. Versatile Design: Snuggle-Pedic tried to please everyone with this pillow and they’ve actually done a good job! It’s good for either back, side, or stomach sleepers. This is partly because you can shift around the shredded foam with your hand to calibrate the optimal density. It’s firm enough to maintain the shape you need, while still being pliable enough to adjust to your sleeping specifications. Made in the USA: Every once in a while there is a scare about foreign products, for whatever reason. I’m generally not a “nativist”, but I like supported local jobs and knowing that the pillow is made with quality US Certified foam. 90 Day Refund Policy + Free Exchanges: The company is really great with customer service. They’ll send multiple emails explaining their product and asking you for feedback. If anything goes wrong, they are the only company I’ve seen to offer a “no questions asked” return policy AND a 20 year warranty. This makes it much easier to spend the extra dollars up front. Pricing: I’ve shopped around a bit for the best place to buy this pillow. It normally retails for $149, but I was able to find it here for $69.99 with free shipping. Not too bad! Memory foam pillows are not for everyone. The way they are constructed, they are best suited for back sleepers, not side or stomach sleepers. This isn’t to say that all side sleepers or front sleepers will dislike the memory foam pillows, but it’s just more likely that back sleepers will get the most benefit from them. Also: Memory foam products can frequently come with a mild odor that is distinct to the new products. This eventual goes away, but if you are very sensitive to smells this might be a problem. It’s not a bad smell, but there can be an initial slight odor (kind of like “new car” smell). 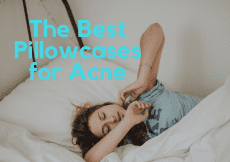 The Best Firm Pillows for Sleeping – Cut the Soft Stuff!